We need to shed light on this topic. 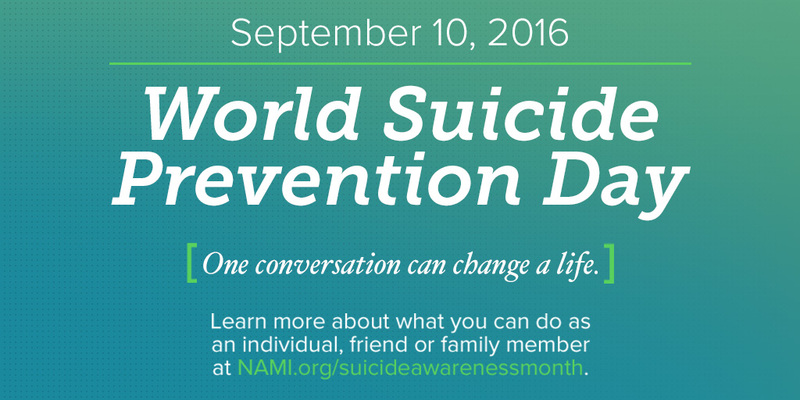 Regardless of what day it is, we need to talk about suicide. Suicide Awareness Day is this weekend, so my observance is early. But I cannot overlook how important this day is and all it stands for. As much as I discuss mental health, it becomes difficult to discuss when the delicate topic of suicide comes into play. We still don’t know the right things to say or do. We tiptoe around the details and blanket it as a single issue. Just like mental illness, suicide is complicated. It’s messy. It doesn’t have a one-size-fits-all answer. We are still figuring out how to understand it, how to address it, how to handle the aftermath. There are so many angles regarding suicide and its prevention, how do we focus our intentions to make an actual impact? With what progress we’ve made already, why do we still have high suicide rates? Because our efforts aren’t cohesive. One organization or entity might be proactive, but one other influencer could be two steps back. Take social media. Take glamorized misconceptions of mental illness. Take 13 Reasons Why. Take public reportage and reactions to suicide. We still make very distinct lines between us, the living and breathing, and the mere thought of death. And to think of inflicting death upon yourself seems foreign. Unspeakable. Death is a natural antithesis to life, but thinking about and considering death is somehow unnatural. Throw mental illness into the mix and then we really have a problem. We don’t want to admit that living in the modern society we do, the influences and resources we have, might not be ideal. That human nature isn’t equipped to thrive on instant gratification and distraction and noise. We don’t want to highlight the flaws we feed through our comparisons, our pressures, our anxieties, our expectations. To do all of that would mean to force change, and let’s face it, that’s not easy. But we need to do it. We need to be vulnerable and honest with ourselves. We need to admit our imperfections. We need to learn from our mistakes. We need to keep moving forward. There is still a long way to go, but I do believe we’re getting there. We’re starting the conversation more. We’re asking those hard questions and really analyzing our actions and intentions. We’re speaking out about our own experiences and emotions. And we’ll keep doing more. Keep fighting. Because I can never remind you enough: you are not alone. Your feelings are valid. Help is available, so please seek it out. It’s okay to not be okay. If anybody out there needs any support or encouragement, I am always here for everybody, and I truly mean that. Nothing in life is too bad or difficult or unmanageable to justify suicide. Life is hard and tragic, but it’s beautiful, too, and I hope everybody can reach a place where they can see and experience that. You are worthy of love, of hope, of life.